I just flew from London to Seattle and during the 9 hours and 40 minutes flight, I watched movies, TV, and more TV. As I posted in 5 Things You Might Not Know About Me, I basically never watch TV so it was random luck that I even looked at the TV options. One option was titled something like Federer, Wimbledon 2008 and I chose it because of David Foster Wallace's article Federer as Religious Experience. 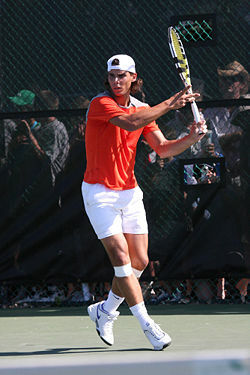 * I was focusing on Roger Federer and trying to see what DFW saw, but ultimately I couldn't keep my eyes off Rafael Nadal. To explain my ignorance, I had no idea who was going to win and had barely even heard of Rafael Nadal. This is remarkable considering that I was in Paris when the French Open was played in June and in London when Wimbledon was played in July. I was so mesmerized by this game, and especially Nadal, that I stopped watching the movie Baby Mama and switched back to the Sport channel and watched the game again. Over the 9+ hours, I think I watched it four times. So thank you again David Foster Wallace for helping me to see something I was ignoring or forgetting about this glorious world we live in. If you're wondering what I'm talking about, read DFW and watch some Federer or Nadal, especially this greatest match ever. *And/or, see a PDF of the print-version of DFW's Federer as Religious Experience.